There is a popular hindi saying that goes 'kahin pe nigahen, kahin pe nishana'. After Hardik Pandya was declared unfit, it was a great opportunity for Vijay Shankar to prove his mettle. The thought process always was that Hardik would always be the first choice and when he is fit, he would be an automatic choice into the team eleven. Vijay Shankar would always be a back up for him and is being a given an extended run to give him match practice. The #4 slot of any team is vital. Not only would this person sometimes be required to stabilize an innings but also be required to play a cameo and give the innings a bit of a push. Ambati Rayudu seemed to be the perfect #4. His match winning innings of 90 on a green wicket in New Zealand, was testament to this. 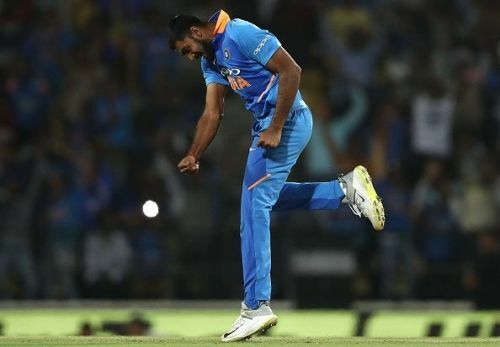 In the current series, especially in the 2nd ODI, Vijay Shankar was given to bowl the final over to a well set Stoinis. It was a big gamble as all the other main bowlers had finished their quota of 10 overs. It was a toss up between Kedar Jadhav and Shankar. The latter was given the ball. It is a very good chance that India was looking to extract the maximum out of Vijay Shankar and test him under a high pressure situation. Vijay Shankar delivered and would have put a smile on the faces of the Indian selectors. With Ambati Rayudu, not performing barring the one match in New Zealand, his position is at stake. Rayudu vs Pant would have been the ideal battle for #4. The question of Rayudu vs Shankar would never have come up, but it is possible that MSK Prasad & Co. would have been eyeing this possibility. India's batting bench strength is so strong that to get a place in the final eleven is very tough. What these 3 matches have done is now throw open the possibility of playing Vijay Shankar for Rayudu. This will give India the chance to play 3 all rounders if Pandya is fit and back. Vijay Shankar is a batsman who can give Kohli a few overs. If Jadhav and Pandya also feature in the playing eleven, the Indian middle-order becomes very stable and gives India the choice to play their top bowlers. This then would become a lethal team.